Characterization of RBC-derived microparticles from Townes mice. 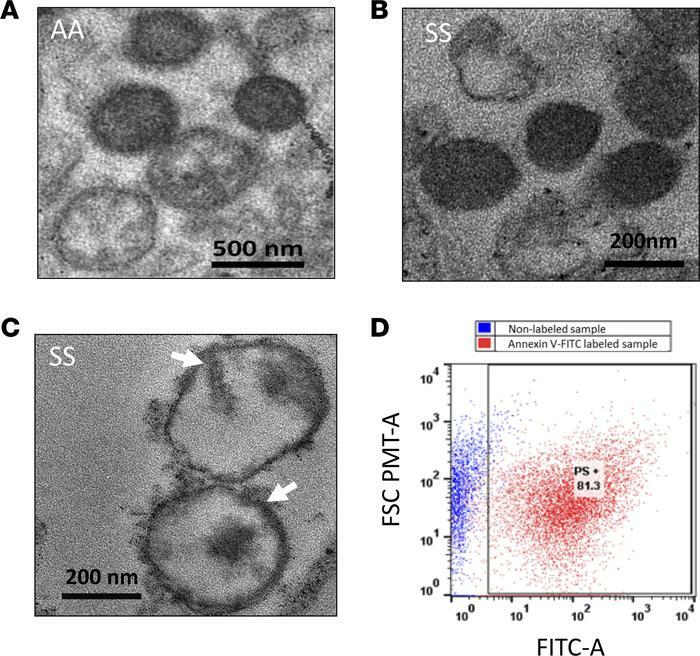 Representative transmission electron microscopic images showing Townes-AA (A) and Townes-SS RBC–derived (B and C) shear stress MPs of size ranging from 200 to 500 nm. Solid white arrows indicate dense protein aggregates within MPs. All images are representative of experiments repeated at least 3 times and obtained from different MP preparations. (D) Representative scatter plot shows quantification of PS+ MPs by flow cytometry using FITC-conjugated annexin V following calibration with standard silica beads. Scale bars: 500 nm (A); 200 nm (B and C).